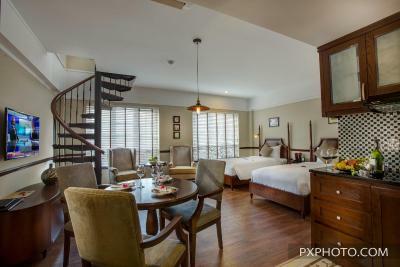 Lock in a great price for Hanoi La Siesta Hotel & Spa – rated 9.6 by recent guests! Outstanding customer service! The entire staff was polite and professional. Everyone made the extra effort to ensure our stay was pleasant. Beautiful rooms. Excellent staff. Great pool. Shuttle service was convenient. Hospitality was exceedingly fantastic! Staff knew our names, was always helpful and friendly,transferred luggage between EHG Hotels, provided prompt and efficient transportation for excursions/airport, packed us surprise take seats for our late international departure. Location was amid the Night Market & Bia Hoi activities. Duplex suite was spacious. EHG really impressed all of us!!! Great greeting from Ling (KayLee). Very beautiful facility plus all the staff very friendly and helpful! The breakfast was excellent. There was a large selection of different foods and it was very tasty. The room was very clean and beautiful. The staff offered such a personal service, that it made the whole experience feel extremely exclusive. The hotel is lovely, the breakfast brilliant, we even had 2 spa services as they were so good! The staff went beyond our expections. Scarlett at the front desk made our stay unforgetable. The hotel arranged for us a day trip to Ninh Binh with a private guide. We had a framed photo of our family in our room upon our return! 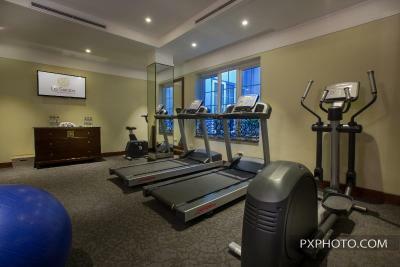 The hotel is ideally located in the old quarter near everything. Very friendly & helpful team of employees. Special mention to the Front Desk Team (Scarlett, Kaylee, Mia & Long). Great customer service ! Well done ! This is one of the best hotels we’ve ever stayed in. The rooms are comfortable and clean. So are the bathrooms. Excellent breakfast buffet in the morning. Location couldn’t be better. Walking distance to pretty much everything. What really sets this hotel apart from any we’ve ever stayed at is the staff. Everyone was excellent. A level of service that you would expect at a hotel charging thousands of dollars per night. The staff greets you by name whenever you enter the lobby. I have a gluten problem and every staff member in the restaurant made sure that my food was gluten free. The staff arranged tours and airline bookings, and they even assisted us with tours that were not booked by them. They cater to your every need. They look out for you all the time. Truly amazing! By the time we left, it felt as if we were saying goodbye to loving family members rather than hotel staff. 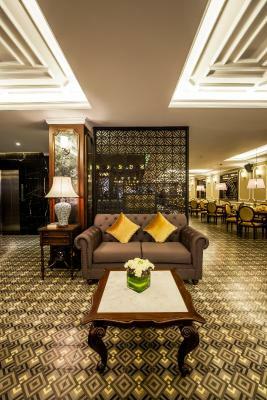 Hanoi La Siesta Hotel & Spa This rating is a reflection of how the property compares to the industry standard when it comes to price, facilities and services available. It's based on a self-evaluation by the property. Use this rating to help choose your stay! 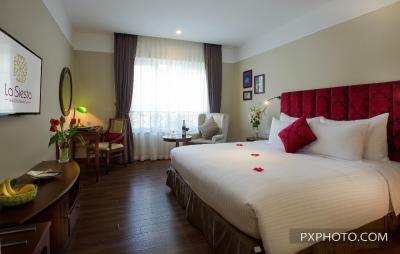 Hanoi La Siesta Hotel & Spa offers a selection of cozy rooms and suites with free WiFi in Hanoi. 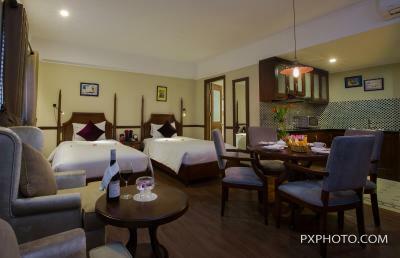 Featuring its own restaurant, the hotel also has a 24-hour front desk. 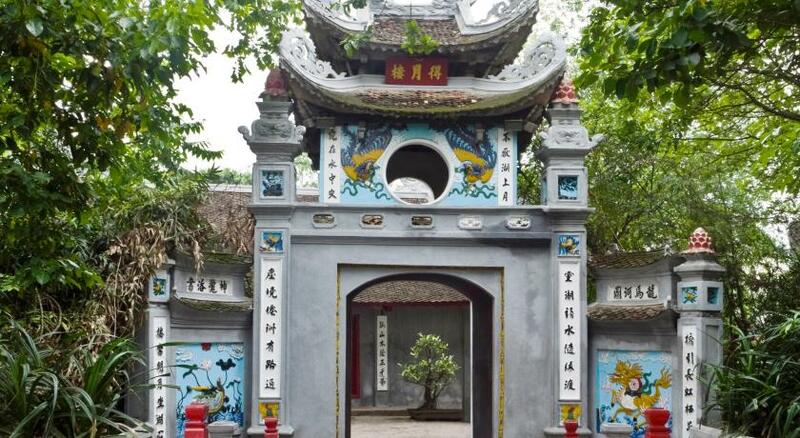 The hotel is 1,000 feet from Old City Gate, 1,650 feet from Ngoc Son Temple and Dong Xuan Market. Noi Bai International Airport is 13 mi away. 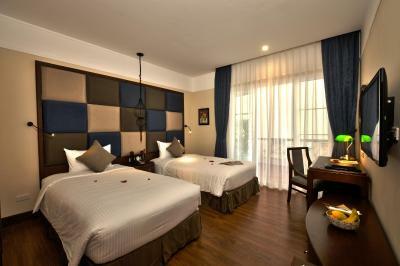 Each room has a flat-screen cable TV, safe, electric kettle and mini-bar. 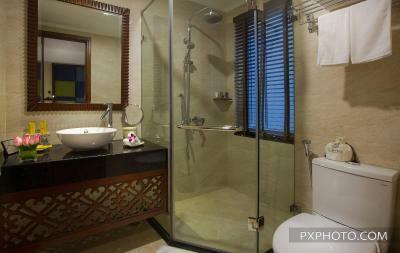 A seating area and private bathroom with bath, shower and hairdryer is included. Guests have access to a tour desk, ticket service and shared lounge. A bar is also available. 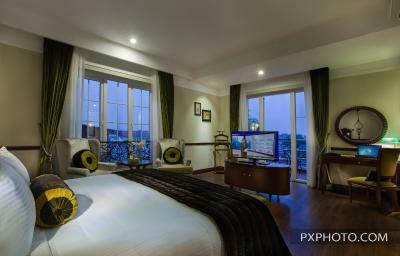 When would you like to stay at Hanoi La Siesta Hotel & Spa? 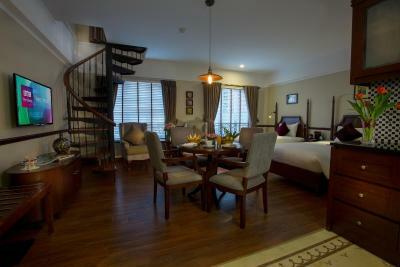 This spacious family suite has 2 air-conditioned bedrooms. There are also a mini-bar, mini-bar, seating area, and a flat-screen cable TV. 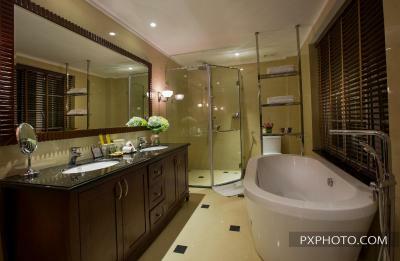 The private bathroom has bath and shower facility complete with hairdryer, slippers and bathrobes. This twin/double room features a seating area, electric kettle and mini-bar. Featuring interconnecting rooms, this air-conditioned family room has a flat-screen cable TV, safe, electric kettle and mini-bar. A seating area and private bathroom with a standing shower and hairdryer is included. This suite features a cable TV, seating area and air conditioning. 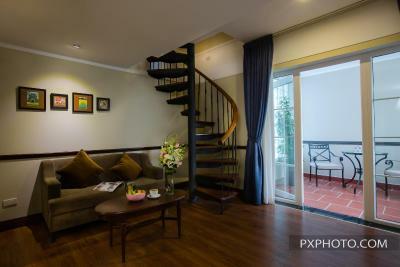 Features a living room on the 1st floor, and a bedroom with King-sized bed on the 2nd floor. 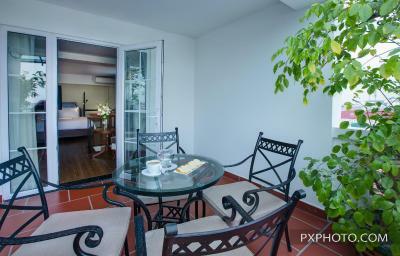 This air-conditioned duplex suite has a flat-screen cable TV, safe, electric kettle and mini-bar. 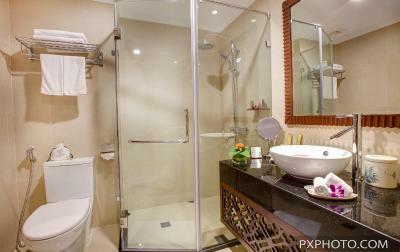 A seating area and private bathroom with bath, shower and hairdryer is included. Features a bedroom with a King-sized bed or 2 single beds on the 1st floor, and a bedroom with a King-sized bed on the 2nd floor. 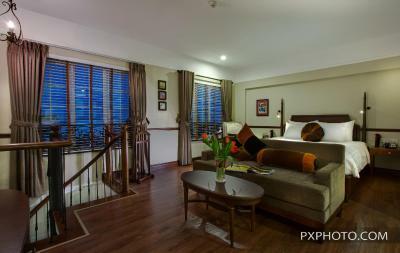 This air-conditioned club duplex suite has a flat-screen cable TV, safe, electric kettle and mini-bar. A seating area and private bathroom with bath, shower and hairdryer is included. 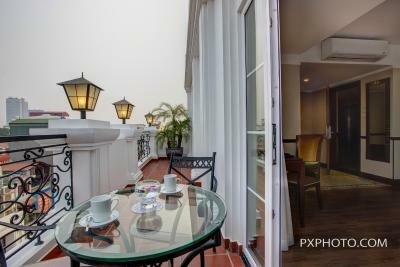 House Rules Hanoi La Siesta Hotel & Spa takes special requests – add in the next step! One child under 6 years is charged VND 232596.46 per night when using existing beds. All children under 12 years are charged VND 348894.68 per night for extra beds. 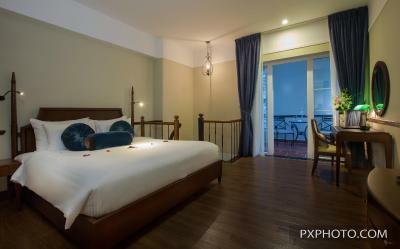 Any additional older children or adults are charged VND 581491.14 per night for extra beds. Hanoi La Siesta Hotel &amp; Spa accepts these cards and reserves the right to temporarily hold an amount prior to arrival. Hanoi La Siesta Hotel & Spa accepts these cards and reserves the right to temporarily hold an amount prior to arrival. 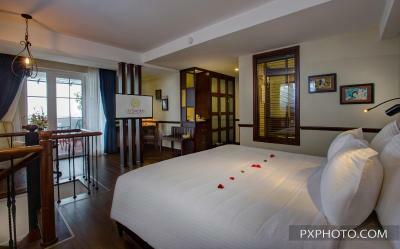 Please inform Hanoi La Siesta Hotel & Spa of your expected arrival time in advance. You can use the Special Requests box when booking, or contact the property directly using the contact details in your confirmation. Breakfast was very minimal, not much in the way of healthy food. 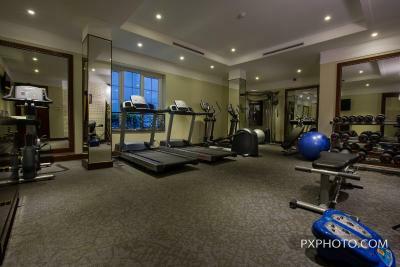 Great location, staff is very helpful. The drinks at Happy Hour took a little too long to prepare. A more frequent shuttle would’ve been more convenient but taxis are very easy to obtain as well. The friendly staff! Especially our warm welcome from Peter! The surprising quality and variety of the breakfast buffet. Gracious gesture of goodbye gift and farewell wave. Buffet breakfast was good. Staff extremely helpful and attentive. Always caring and smiling. An amazing high quality hotel, located in a great location, with some of the best most attentive hotel staff we’ve come across on our travels. Location, staff and good buffet breakfast. Housekeeping was a bit too prompt and hasty. We vacated a room a night early (although it was prepaid) yet when we returned to check the room hours later, a new guest was checked into the room(brushing his teeth). Our key was still operable and opened the room to both our surprise! Housekeeping also laundered clothing set aside in a laundry bag which was near an open suitcase without any instructions to do so. 2 Rose apples placed in a our welcome fruit baskets were missing after housekeeping had entered. We were looking forward to trying them. The service was outstanding. We felt really welcome and cared for. The lady at the front desk gave us wonderful tips on where to eat around the city. The room was beautiful and full of interesting design details. It was luxurious. We loved the balcony. The location was excellent. During the weekend, the street in front of the hotel was closed to traffic. First of all the staff, especially Mia who arranged everything for us. The location was the best you could want in the Old Quarter. The small boutique hotel itself was quaint and beautiful and we felt so lucky to stumble upon this magical place. It was simply perfect and an experience we will never forget. We came to Hanoi on a whim and had 3 days. Not knowing much about the city, Mia arranged our entire stay. Mia is the person that made this experience more than a 5 star. Her kindness and graciousness...and professionalism ...we couldn't have asked for more.